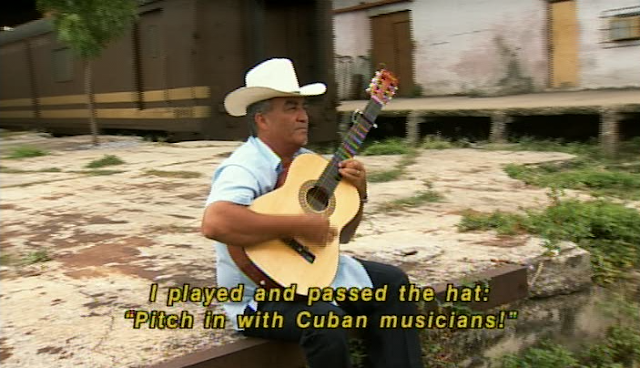 Buena Vista Social Club (1999), by Wim Wenders, has a lovely stand-alone segment about the musician Eliades Ochoa (above). Wenders weaves together two performances of "El Carretero," one with Ochoa alone and one with the big band in performance. The segment is notable for avoiding a "talking head" interview; instead, Ochoa is heard in voice-over, reminiscing about his growing up and musical influences. Wenders circles Ochoa with a handheld camcorder, and when "El Carretero" begins, he dramatically cuts to the same song on-stage. 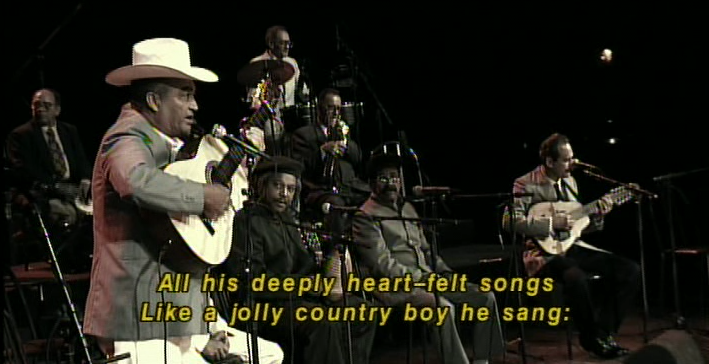 It's a memorable edit that connects the son tradition to more commercial music as well as establishing Ochoa's range as a musician in his own right.